Once I was able to get initial low band antennas on my half acre house lot (see my page on a folded counterpoise for 160M), I turned my attention to improving my receive capabilities. The gold standard for 160M receive antennas is of course the Beverage antenna. However, at approximately 300 ft, the Beverage isn’t practical in a ~100 x 200 suburban lot. Fortunately, two alternatives exist with much smaller footprints. 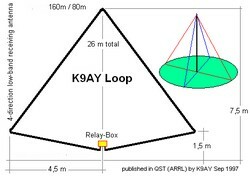 Both antennas are based on receiving loops, the K9AY loop antenna and Shared Apex Loop Array. With receive antennas, antenna gain is not used as the figure of merit. 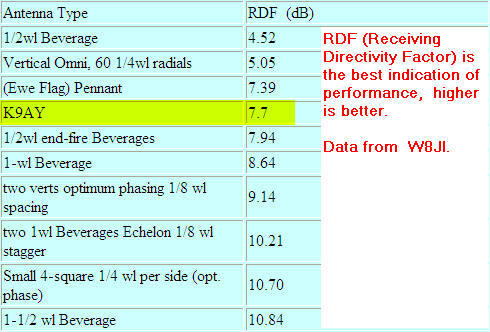 Rather, Relative Directivity Factor (RDF) is used. RDF is the difference between the maximum forward gain in the direction of interest and the average gain in all directions of an antenna. The table below shows a comparison of some low band receive antennas. Much more information on the RDF for various antennas can be found here. Here is a picture of the K9AY loop. Two perpendicular loops are required. The relay box switches the loop receive directions. Most often a receive amplifier is also needed. Below is a picture of a Shared Apex Loop. This antenna was created (and patented) by Mark Bauman, KB7GF. Mark did ( and continues) quite abit of experimentation to optimize antenna performance. Mark published his results in an article for QEX available here. The Shared Apex Loop is sold exclusively by Array Solutions Inc. The Shared Apex Loop has an RDF between 8 and 10dB. I use an SAL-20 from Array Solutions and located it in the back corner of my house lot. I have found it to be a very effective receive antenna on 160, 80, 40 meters. Complimenting my 160M inverted L and 80 & 40M dipole.